Tourist s who have a chance to visit the northern province of Ha Nam should discover the ancient Nha Xa silk village in Moc Nam Commune of Duy Tien District. This and Ha Dong in Hanoi are the most well-known silk villages in the nation. 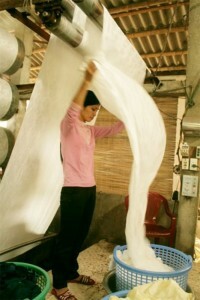 Nha Xa’s silks are known for quality, color and beauty. Nha Xa is located right next to the Red River’s dyke, right under the Yen LenhBridge linking two provinces of Hung Yen and Ha Nam. Locals insist that the village had its glory days back in the 1930s when people from the north to south and even foreign countries used Nha Xa silk. There was a time when the village’s silk could not compete with Chinese silks. However thanks to the devotion and ambition of villagers, Nha Xa silk has been preserved until now after over 100 years. The whole village of 230 households, with a population of around 800 people, earns a living from producing silk from 200 weaving machines. Especially, each family in the village has their own secrets of mixing colors and adjusting temperature to dye silk to have the perfect color which will not fade easily. Dyed cloth then is washed and dried by machines and not by the traditional method of sunlight.